The work of creating the future is being done now – and much of it is unsustainable in terms of natural and cultural resources. How will the next generation of leadership for environmental sustainability be raised up? Can we imagine sustainable futures, and can we enable transformative leadership to help us realize them? How can we best ensure that the several generations share their particular knowledge? What are the ethical frameworks, methodologies, curricula, and tools necessary for advancing and strengthening education for intergenerational sustainability learning and leadership? La Asociación Accions 3E convoca y organiza el 1º Festival Internacional de Cine del Medio Ambiente de Latinoamérica (en adelante: FiCMA LatAm), nacido como una ventana del FiCMA Barcelona /Festival Internacional de Cine del Medio Ambiente), que desde 1993 hasta la actualidad se celebra anualmente en la ciudad de Barcelona, España. El FiCMA es decano en su género y tiene como principal objetivo promover, difundir y divulgar antes, durante y después de la celebración del evento, el audiovisual en cualquiera de sus formatos relacionados con el medio ambiente y estado del planeta. The Education for All (EFA) Global Monitoring Report (GMR) is an authoritative, analytical, evidence-based report, which has monitored progress on an almost annual basis towards the EFA goals, and the two education-related Millennium Development Goals since 2002. A final report on EFA achievements and remaining challenges is soon to be completed and will be launched in April 2015. Starting in 2016, a new series of reports will monitor the state of education in the new framework of the anticipated Sustainable Development Goals (SDGs). The first report in the series, the 2016 Report, will be ‘Education, sustainability and the post-2015 development agenda’, as decided with the strong support of the GMR Advisory Board. The 2016 report will focus on the complex interrelationships and links between education and key development sectors, and determine which education strategies, policies and programmes are most effectively linked to the economic, social, environmental and political priorities of the new sustainable development agenda. The report will also establish a new monitoring framework for education, and examine key financing and governance challenges for the post-2015 era. We are keen to hear your views on the chosen theme. Your help will contribute to our thinking on education’s role in sustainable development, and to the shape and content of the report. We particularly welcome experts from non-education sectors to be part of this public consultation, as well as researchers, sector experts, practitioners, teachers, governments, non-governmental organizations, aid donors, and anyone with an interest in education and development to share your views. Please read the concept note and contribute to this online consultation before 28 January 2015. If you would rather email your comments, or have attachments of documents or data that you would like to share with the Report team, please send them directly to efareport@unesco.org with ‘2016 Report Consultation’ as a subject heading. Source: 2016 Education Report consultation: Education, sustainability and the post-2015 development agenda. 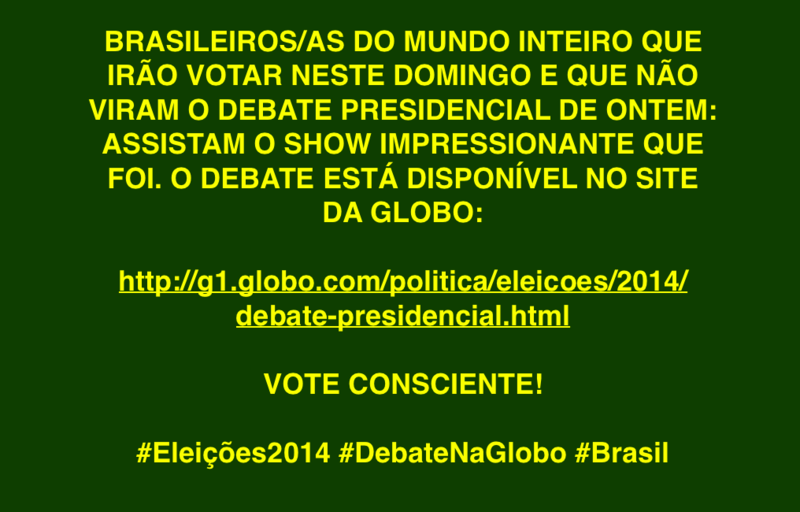 Votem consciente! Assistam ao último debate presidencial.